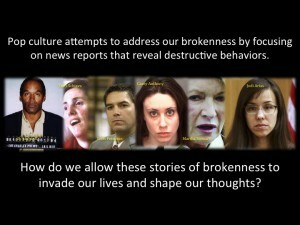 Brokenness is a part of each of our stories. It is not something to hid from, ignore, or explain away. It is a real part of life. Johnny Cash new this better than most. Johnny Cash was considered the lens through which to view American contradictions and challenges. He was a Christian that claimed to be the worst of sinners. His life was filled with fame and obscurity and he left the world broken. This is just one of many expressions of pop-culture that touches our hearts and connects our lives through our common storyline of brokenness. The Problem with pop culture is that it tends to glamorize, popularize and normalize brokenness. This leaves us with a deep understanding of what it is to be broken, but without a remedy. The Gospel delivers the remedy. The Word of God defines, contextualizes, and identifies brokenness as a byproduct of sin. Sin is as natural occurring part of life that reminds us we are broken and need to be fixed. Sin doesn’t make your bad it just makes you dead. Are you broken and stuck? Can you trust God to help you? Can you help others that are broken to experience God? Learn More about the Hero Next Week.